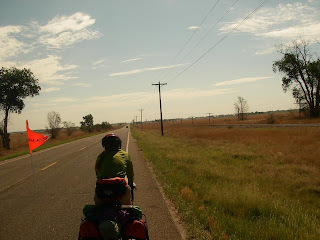 Yesterday Belinda's Mom and stepfather John loaded our bikes on their motorcycle trailer and delivered us to Ordway, a little east of Pueblo, where we rejoined the Trans-America Route on Hwy 96. We are very grateful for Sandy and John's hospitality and the time they shared to reconnect us with our route. 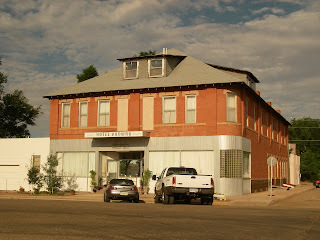 We spent a pleasant night in the Hotel Ordway, then after a hearty breakfast, set out into the Plains. At breakfast we met two other cyclists, Gabby and Cesar who were going our way. We left the restaurant ahead of them but believed they would catch us on the road as they were lightly loaded compared to us. Our goal of Eads, Co. was 63 gently rolling miles away. We made good time for the first 20 miles averaging 11 mph. But at 11:30 a headwind slowed us considerably until at Haswell our average had dwindled to 9.3 mph. At Haswell we took a good break in a little park in the shade. When we continued the wind had moderated somewhat and we were able to make better time. 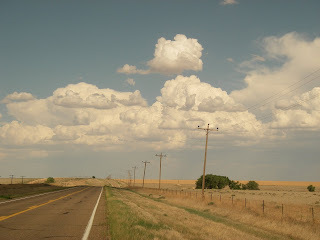 As we rode on, the sky became more and more dramatic with thunderheads building to the South and in front of us. We began to wonder what Ma Nature had in store for us. Five miles from Eads the sky in front of us becme very black, the wind was buffeting us from the South and we were seeing lightning strikes ahead. We felt as though we were in a race to get into town ahead of the thunderstorm! Well, we made it, and checked into the only motel in town (we didn't feel like camping under these circumstances). A while later we walked to a store, all the restaurants in town being closed on Sunday, and there were Gabby and Cesar just arrived. Cesar did a recognisance and found a bar open that also served food, so we joined them there for a very enjoyable meal. Oh yes, those are the images I recall from riding across the midwest in the early 70's! Lots of puffy white clouds and seemingly endless roads stretching out into the distance. Just got back last night from the unbelievable, OUTRAGEOUS performances at the Crossfit Games in Aromas. Those incredible athletes made me feel like a true imposter. After 3 intense workouts in one day, the 135lb. wonder, Chris Spealler, led all the male competitors, but today's workout dramatically favored heavier athletes, and he dropped back to 10th. I got to shake hands with Coach, Lauren, Lynne, Coach Burgener, and Nicole! I so wish I could have experienced it with both of you. Hey Mark, Well we wish we could have been at the games as well. Did you enter the fray? We were told that this year they might have age group competition. I wonder if this came to be? We have been lobbying for this since the first Crossfit games. Spealler really is a fantastic athlete, but as you point out, when heavy lifting is involved the prize goes to the heavy guys. Take care Mark.